True Water Australia are your Service Station sewage treatment specialists. There are specific challenges to consider when designing and installing onsite sewage treatment plants for Service Centres. Sewage strength, high levels of grease and oil and the use of harsh chemicals are important issues to overcome. With most service centres hosting fast food outlets, comprehensive public amenities and a range of staff employed by different entities, these challenges require special consideration. True Water work with Service Station owners to deliver Sewage Treatment Plants designed to manage high strength sewage. Our consultancy team specialise in accommodating site limitations and development requirements, while managing council permits and navigating State legislation. We design reliable and efficient industrial sewage treatment plants to suit each individual project with a focus on performance and longevity under Australian conditions. True Water provide industry leading wastewater treatment technology throughout Australia and the Pacific through our exclusive partnership with Kubota. Kubota’s modular treatment plants are manufactured in Japan under strict international quality guidelines. Kubota can meet the requirements of any commercial or industrial application, with a large range of STP models, . True Water then design a complete sewage treatment solution. Importantly, it is customised to suit the specific requirements of your site. True Water were engaged by Hutchinson Builders to design, manufacture and install the onsite sewage treatment system for the Chinderah Service Centre. The packaged treatment plant was designed to process wastewater from the entire development, then discharge the treated water within a small area. The service centre includes a Caltex fuel outlet, Caltex Star Mart, Truckers Lounge, amenities and a fast food Convenience Hub including McDonalds, KFC, Oliver’s and The Coffee Club. The highway service centre has a high volume of traffic utilising its services. The 4 hectare site is between the Pacific Highway and Tweed Valley Way in Northern NSW. Being a flood prone site, it was important to provide a solution that would remain operational during severe weather events. This was particularly challenging as the site consists of 90% concrete apron hardstand and has a high water table. Operational since 2016, the STP has provided ongoing compliance under demanding conditions. Our initial installation is designed to treat up to 40kL per day with the ability to be scaled up to treat 100kL’s per day. The unique modular design makes it simple to forward plan for future expansion over the next 50 years. The STP at Chinderah Service Centre is independent of the Council Wastewater Treatment Utility but still subject to government regulations. As part of our ongoing service, True Water have been working with stakeholders to ensure the system is always compliant and working at its best. 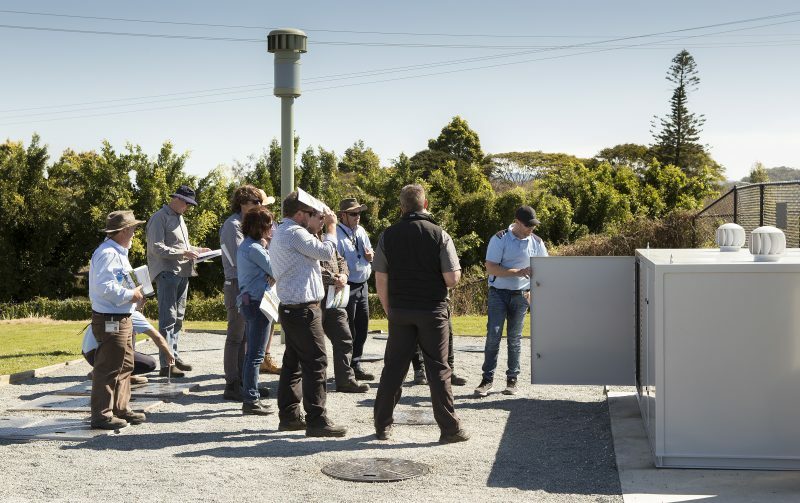 In 2018 the Tweed Shire Council selected this service station sewage treatment system as a model example of commercial onsite wastewater treatment. Councils throughout the region are looking for solutions that work. The majority of commercial STP’s in the region are failing to comply with standards. Tweed Shire Council invited councils from across Northern NSW to attend the site to inspect the system. As part of a full day of information sharing, they were able to get hands on and learn about the success of the system. Representatives from six councils in Northern NSW learn about the workings of a True Water Australia sewage treatment plant at the Chinderah Service Station. The size and requirements of a service station sewage treatment plant can vary dramatically. This can be due to increased traffic and the expansion of services. For the Benaraby Truck and Travel Centre project, the development has been planned in 4 stages. It was important to provide a wastewater solution that could be delivered in conjunction with each stage of the development. True Water Australia designed a STP that can accommodate the specific requirements of the site at each stage. The design also allows for easy addition and expansion. Located on the Bruce Highway at Benaraby in Central Queensland, the Caltex truck and car refuelling station will service the travelling public. Along with the service station, the plans include up to 3 fast food restaurants, each with their own separate drive-thru facility, and a major retail site for either a small format supermarket or tavern. True Water designed a solution to meet the specific requirements of the project. Our consultants planned for the staged installation of the STP and associated land application area. While accommodating the size constraints of the site, we were able to provide a high quality, compact STP with the smallest possible footprint. True Water will now work with the clients well into the future as their project continues to expand. True Water will undertake both consultancy work and STP installations for BP service stations throughout New South Wales. Existing packaged sewage treatment systems will be inspected and tested for compliance and reports provided as part of our consultant’s works. Our recommendations will detail how the systems can be improved or modified to provide the best compliance and management outcomes. Our Works and Services Group will complete the replacement and upgrade of a failed treatment system in Northern NSW in the coming week. The previously installed concrete aerated tank can not be retrofitted to improve treatment quality because it was not designed to treat the strength of sewage generated by a service station. True Water will install a suitable system to replace the failed tank as part of a complete sewage treatment solution. 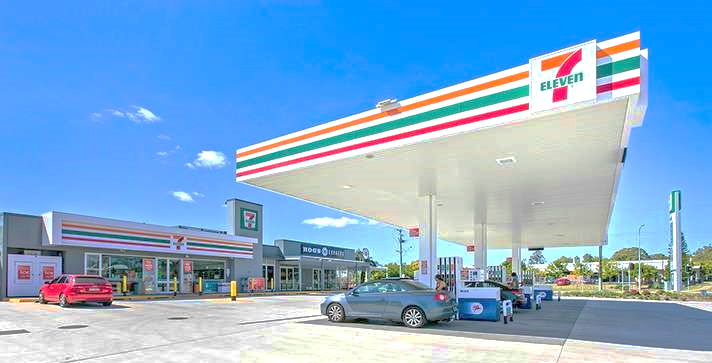 7 Eleven engaged True Water to install a specialist sewage system for their service station at Burpengary north of Brisbane. This wastewater treatment solution required a unique design. The client requires a system that can be adapted to future development options and to maintain flexibility for the site. Our wastewater consultants designed a treatment plant with a small footprint and minimised land application area to accommodate possible future subdivision of the site. Alternately, there is also potential for future expansion and staging of the treatment plant if the client chooses to expand on the development. True Water have undertaken site inspections of pre-existing STPs at a number of 7 Eleven petrol stations in QLD as part of our ongoing support services. We were asked to identifying problems with the effectiveness of the systems and their suitability to the task. It is important that we help our clients utilise existing infrastructure when dealing with their wastewater treatment needs. We were able to provide recommendations to 7 Eleven to ensure their systems operate compliantly and efficiently into the future. True Water recently undertook a viability assessment on the existing treatment plant for a large new United service station in Queensland. Works included monitoring of plant operation and flows, as well as the implementation of appropriate maintenance schedules. Kubota sewage treatment plants (STPs) feature a slimline design. Our experienced design team can provide numerous recognised options when designing your Land Application Area. This significantly reduces the area needed for sewage infrastructure on your site. We even ensure a low visual profile, so your onsite sewage treatment system can fade into the background. True Water design service station sewage treatment plants that can expand in line with future growth of the project. Importantly, this means our clients can stage their STP install to correspond with the growth of their investment and minimise upfront costs. Kubota systems reduce operation overheads by up to 80% to provide the best possible installation and operational costs. The treatment process is simple enough to eliminate internal moving parts, while being technologically advanced. The plant is robust and manufactured under strict international standards. Our STPs will always treat your wastewater to the highest quality specific to your project. In addition, the discharged treated water is safe and reusable with neutral or beneficial impact on the surrounding environment and no risk to personnel. The reliable, advanced level of wastewater treatment of our systems adheres to all local and state government regulations. True Water will keep your service station sewage treatment system operating at its peak. After install, we work with our clients to adjust the system settings and provide information for staff and tenants regarding ‘best practice’ use of the system. The advanced engineering of our systems means less servicing and maintenance requirements for you. This reduces operational costs and ensures the system functions as designed with minimal operator input. Find out more about our Commercial services here.